There are several reasons why reeds close up too much when we start playing on them and the main one is that there is simply too much biting being done by the embouchure. This can actually be caused by the reed being too open from the start, so the first place to look is how does the reed start out. If the reed is too open, you can try and close it down a bit by putting the plaque in and squeezing a tiny bit. Reeds naturally close down a bit when played on anyway. Now, if the opening is fine from the start and you are not biting the reed, then you can actually start to see if there is anything being done in the scraping stage that is causing the reed to loose too much of its structure. The first thing you can check is trying to make your tips shorter and more separate from the heart at the back corners, bringing them back a bit more instead of straight across the tip. The sides of the tip can almost always be thinner. Also, try and leave more in the heart area and most importantly do not scrape off the rails of the back and heart. These will help keep the reed open and along with the heart give the reed the feeling of having some “spring” in it. Although the spine is very important, too much of it will keep the reed from vibrating. My students have the problem of sometimes scraping the heart and back too much along the sides to try and get it to vibrate, only ending up killing the reed and making it unvibrant and closed. Do not be afraid to scrape the back, but make sure the upper back is thinner than the back of the back. Too much out there will also weaken the reed. As far as diameter of the tube cane used, I prefer 10-10.5mm which gives me a better opening. You can also try a slightly narrower shape also, however depending where you are geographically and the altitude at which you are making reeds this may not be too much of an option. I play at around 9000 feet so there are many good narrower shapes that don’t work very well up here. Do not keep the plaque in the reed for too long a period of time while scraping on it as this too will weaken the sides and cause them to separate, not good. 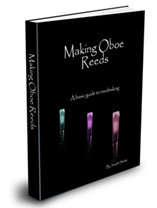 The last thing you can try is to make your reeds over several days instead of all at once. This has helped me a great deal. I hope this helps and I will try and think of some more things on this subject. I would love to know what all of you think so leave a comment down below.